Nothing kills the boring Monday morning "Hey, how was your weekend?" conversation game like saying you went to a music festival to see Jay-Z, Skrillex, Calvin Harris and Pearl Jam. And frankly, we wouldn't expect anything less from Jay, who has yet another business endeavor to tick off his list. Not only has the rapper-clothing designer-NBA team owner-proud father curated the event but he plans to headline it as well. While the two day festival, to be held on Sept. 1 and 2 at Fairmount Park in Philadelphia, is a benefit for the United Way of Greater Philadelphia and Southern New Jersey, there's no doubt it certainly gives both ways. The complete lineup, listed below, boasts an impressive mix of R&B, hip hop, rock and dance that will be the gift that keeps on giving for any music loving fan. Presale tickets are still available both at Ticketmaster and LiveNation. Or there's always the option of winning a two-day pass for you and a guest. Yes, you read that right: win two tickets to attend the festival. One for you and one for a very, very lucky friend. EARMILK is always about helping our readers gain access to these kinds of things. 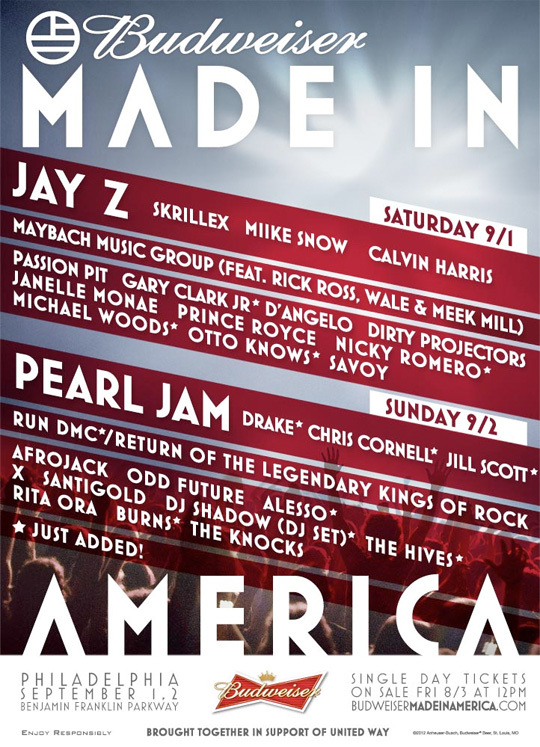 Send an email to CONTESTS@earmilk.com with "Made in America Festival Contest" in the subject line. Include your name, phone number and a brief description of why you should be able to attend the inaugural Made in America Festival. That's it! Remember, August 24, 2012 is the last day to enter. So, you might have 99 problems but tickets ain't one. Keep your fingers crossed and your calendar open for September 1 and 2. Good luck!